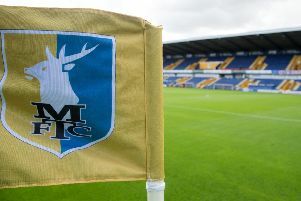 Mansfield Town players have had the shine taken off their thrilling comeback victory at Colchester, after seeing a team-mate suffer a sickening injury. Goalscorer Nicky Ajose admitted it was a 'massive' win for the club against a side also fighting for promotion - particularly given the fact that Colchester led 2-0 at one point. Stags ended the game 3-2 up, but deep in stoppage time Hayden White was fouled by Frank Nouble, who was yellow carded, and White left the pitch on a stretcher. It's thought the Mansfield player has suffered a broken ankle. Ajose was bitterly disappointed for his stricken team-mate. "Obviously it's a massive result for us but a bit of shine has been taken off. Whitey looks like he's got a bad one and we're all gutted for him," said the forward. "I was on the bench and didn't see it but apparently it's a disgraceful challenge. I'm gutted for Whitey, he's a good lad. "We'll get a job done for him. There's nothing we can do about it now, we'll just hope for the best." The striker paid tribute to the impact boss David Flitcroft had on the game at the break, with his side trailing by two goals. "Three goals in the second half shows what we're about," he said. "The gaffer was brilliant to be fair, he just questioned us, asked if we were giving everything we've got, could we do more, challenged us individually. "We stood up to the test in the second half." Beating a promotion hopeful on their own turf was especially pleasing for the Stags, who sit third on 51 points - three clear of the play-off places. "It's a massive result, they were on our coat-tails and we've come to their place and beat them," said Ajose. "It keeps us in there, we're in a good place. "We're happy, but we've got our fingers crossed for Whitey."